Instant live chat communication will become a success formula for business organizations to have a dramatic impact on the end results. The web hosting industry requires satisfaction rate of 100%, interaction, and dealing with issues early on. Live chat technology will allow hosting companies to communicate with the customers and add value to their business in new ways. Affordable Live Chat hosting support ensures that everyone in their client base has the opportunity to receive the percent of issues resolved in a single response. Live Chat offer helps on how to delight customers in just a few clicks and just a few minutes to respond to an issue. Compared to other communication tools, live chat is the fastest tool for hosting companies that allow customers to get in touch with the available help in no time. It increases the likelihood of a better feedback. Tech assistants on the live chat support go beyond the level of voice as well. One of the biggest strengths of live chat communication is that you can handle confused customers in a better way without even talking to them. Overall, the web hosts can have the conversation with the customers on different topics of website creation, web design, scripting, database, SEO, email clients, bandwidth, disk space, IP addresses, DNS, domain names, etc. These technical terms, technical issues related to these terms can be very confusing to a new customer or someone who is new to web hosting. 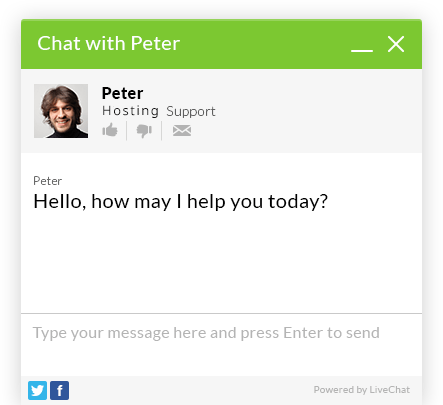 Live chat support is an amazing platform to ask for the solution of almost every problem within the boundaries of web hosting. There’s nothing worse than having problems in your website. It will be less complex with these live customer support that helps drive people to your site, to talk to someone in a hurry to get any problems sorted out, no matter the time of day or night. When your website goes down, computerized live chat sessions only there to tell you what the problem is and also their communication style is more fluent. It can make a substantial difference in all fields, be it technical or non-technical, web hosting support service is no exception.